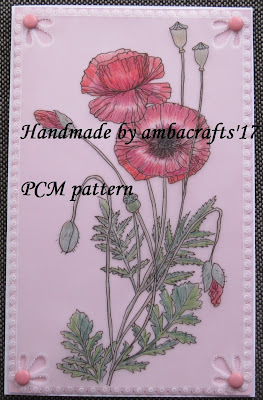 This pattern was for a challenge in PCM. I didn't enter as I'm sure it wasn't good enough; but I was pleased with how it came out. This is gorgeous Alison. If I had longer arms I would smack you on the bottom. Do not put yourself down, your work is awesome. Alison. that card is absolutely stunning. Put it in a frame and display it on your wall.